Actually, as an autistic person, I question the kindness. There's an even more basic question no one seems to have asked: was Bo sitting alone by choice? I ate lunch alone almost every day at school, which was fine. Sometimes other children joined me, at the urging of teachers. They ridiculed me. So certainly, alone was preferable to that. But alone can also just be better. A chance to think. A time not to have to deal with verbal interactions and social processing, which can both be stressful. I take care of autistic children, and often their parents or teachers worry "he spends recess alone." And I do something no one else ever seems to think to do. I ask the child how they like to spend recess. I get some kids who want to join in and don't know how. Those are kids who need adult support to facilitate interactions. But I also have the child who prefers to spend recess playing math games on the computer or walking around the playground looking for rocks. Recess and lunch should be breaks, not more stress. Those are kids who need adult support to understand and respect a choice. I don't see this as an act of kindness at all. It may be, if the child wanted company. But it may also be in the same category of ableism as all the other offers and enforced "help" that doesn't actually help. It's an imposition of neurotypical values that company is better than alone. I think it might also be, in part, an imposition of extrovert values on introverted people and a mind blindness issue where the extroverted non autistic people just assume that being alone a lot is unhealthy and lonely because that's what it would mean *for them* and fail to realize that different people genuinely have different needs. I do recall reading that the mother stated that her son is autistic and often sat alone while eating his lunch. From what she implied, it seems that he was sitting alone not by choice. Yes, as a child his age I ate my lunch at a table by myself, which was by arrangement as all the other kids sat at the same table. I wouldn't have wanted other kids with me although I'd have appreciated an adult. I don't know how that boy felt or the reason he sits alone, but everyone's assuming it was because nobody wanted to sit with him rather than the other way round. The kid's statement to his mother about this incident was, "It was like sitting on rainbows." I don't think he was sitting alone by choice. 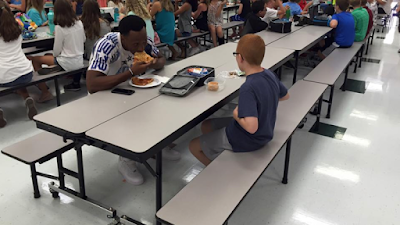 As all comments here indicate a core issue was the student sitting alone by his own choice. Here are the mom's comments: "He doesn't seem to notice when people stare at him when he flaps his hands. He doesn't seem to notice that he doesn't get invited to birthday parties anymore. And he doesn't seem to mind if he eats lunch alone. It's one of my daily questions for him. Was there a time today you felt sad? Who did you eat lunch with today? Sometimes the answer is a classmate, but most days it's nobody. Those are the days I feel sad for him, but he doesn't seem to mind. He is a super sweet child, who always has a smile and hug for everyone he meets. " Mr Rudolph asked the boy if he could eat lunch with him, to which the boy replied "Why not?". So I think that can be interpreted as a welcome gesture, and the boy was even excited about getting his autograph, so I say well done on the part of Mr Rudolph! ... so there you have it! Is this really the world we live in? From the mother's own statements, is seems that Bo did not eat alone "by choice". But what do "we" do, we question the kindness. As the parent of a son on the Spectrum, I would have tracked this athlete to the ends of the earth to express to him how much I appreciate his gesture! For those of you questioning his motives (apparently because he doesn't have autism, or an advanced degree in early childhood psychology, a crystal ball, or a secret decoder ring), know this. The next time a neurotypical DOESN'T make such a gesture, maybe it's because they were afraid you would assume they had an ulterior motive!